Epoch Times staff members were honored with 25 awards at the 85th annual Better Newspaper Contest for the New York Press Association (NYPA). The contest recognizes the best work of newspapers across the state of New York for editorial coverage in news and feature reporting, photography, advertising, and design. Overall, Manhattan-based Epoch Times took home 10 first places prizes, six for second place, five third place finishes, and four honorable mentions. The Epoch Times creative department led the pack with a total of 11 awards and three honorable mentions in the category of design and advertising. For the second year running, the department won two of the most prestigious design categories: first prize in the Richard L. Stein Award for Overall Design Excellence and the only prize for the John J. Evans Award for Advertising Excellence. Creative Director Robert Counts won first place awards for best online infographic and best large space advertisement. Also given a first place award was Luba Pischick for best advertising campaign. An additional first place team award was given to Counts, Seth Holehouse, and Dane Crocker for a special advertising section they created. The creative department was also awarded second place for advertising excellence. Overall, the department won six first place awards, four second place awards, one third place award, and three honorable mentions. In the category of Editorial Coverage, the Epoch Times was honored with a total of five awards for a range of stories about news, events, and people in New York City and beyond. First place for editorial coverage included a spot news story by New York City metro reporter Annie Wu on New Yorkers paying their respects to two police officers who were killed while sitting in their patrol car. Reporter Arleen Richards also won a first place award for her feature story about struggling farmers who support fracking to help them survive a tough business. Richards said she was drawn to the story because it encompassed a little-heard-of point of view. In addition to the two first place awards the Epoch Times won for its editorial coverage, the editorial team won one second place award, two third place awards, and one honorable mention. Epoch Times photographers won a total of five photography awards for their work in 2014. Samira Bouaou won first place for her news photograph of a shocked boy reading a local newspaper in the aftermath of a vicious knife attack on two small children in which the attacker remained at large for several days, leaving local residents terrorized. Benjamin Chasteen also won a first place award for his feature photograph of New Yorkers in vintage clothing in front of some of the city’s vintage trains for an annual get together. Chasteen, who traveled extensively in 2014 for work, said he felt that the recognition helped make it all worthwhile. The entire photography team also won third place for photographic excellence for a total of two first place awards, one for second place, and two for third place. 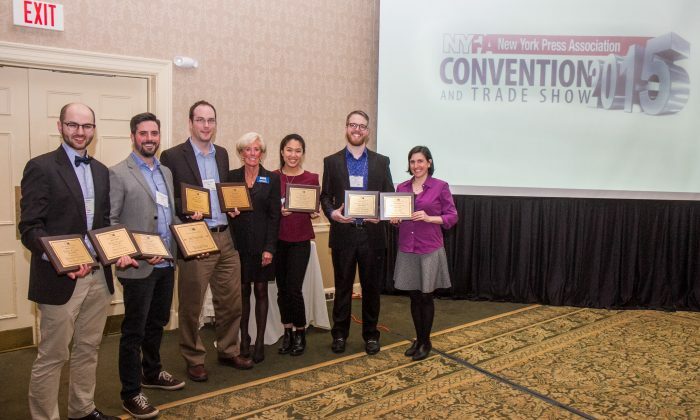 The Epoch Times also won second place for the NYPA’s Past President’s Award for General Excellence. The prestigious first, second, and third place awards in 50 categories are chosen from among more than 4,000 entries every year.